We make a lot of road trips with our frequent trips to Kentucky! 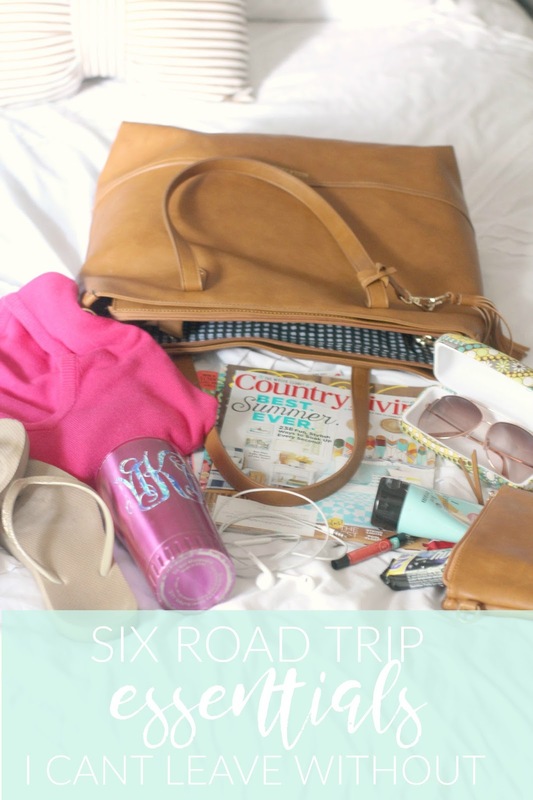 This past weekend we made the trek to enjoy Fourth of July with my family before Preston and I head off to Charleston and I made sure to pack all of my favorite road trip must-haves along with me! Water || We all know the importance of proper hydration, so pack plenty of water and leave early if you're worried about bathroom breaks. Slip-On Shoes || I always feel more comfortable in a cramped car if I can slip my shoes off, so I opt for easy slide on sandals or flip flops that can be put back on quickly for pit stops and lunch breaks. Reading Material || A good magazine or book will make the time go by much more quickly! Personal Care || Nothing is worse than dry hands (especially after using that cheap truckstop bathroom soap), chapped lips, or a starving tummy. I always keep a little hand lotion and chapstick with me in all my bags and for road trips I like to pack a light snack to tide me over until the next leg of the trip. Our road trips are always a breeze thanks to all of these extra essentials (and usually a stop for some chicken nuggets along the way)! Is there anything you can't live without on a road trip?